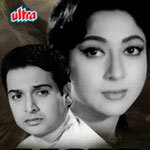 "Aasra" is a 1966 hindi film which has Biswajeet, Mala Sinha, Ameeta, Jagdeep, Balraj Sahni, Nirupa Roy, David, Bela Bose, Laxmi Chhaya, Farida Dadi, Polsan, Sabina, Lata Arora, Archana Kapoor, Narbada Shankar and Master Shahid in lead roles. We have 3 songs lyrics and 3 video songs of Aasra. Laxmikant and Pyarelal have composed its music. Lata Mangeshkar and Asha Bhosle have sung these songs while Anand Bakshi has penned its lyrics.